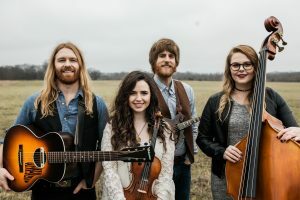 Elm Street Cultural Arts Village’s new Lantern Series will debut at 7:30 p.m. June 2 with a performance by Nashville-based quartet The Barefoot Movement. This will be the first Woodstock appearance for the band, an Americana act featuring bluegrass instruments, pop-based melodies and toe tapping energy. Their latest release “Live in LA” was produced by Chuck Plotkin (Bruce Springsteen, Bob Dylan) and Hank Linderman (Eagles, America). The band has toured extensively, from 43 U.S. states to Africa, where they were guests of the United States Embassy in Burkina Faso. In 2014, they were named band of the year at the Momentum Awards by the International Bluegrass Music Association. They have been called “one of the most promising bands on the bluegrass scene” by CMT Edge. For ticket information, visit www.elmstreetarts.org/the-barefoot-movement.